Large, protruding calluses, often, soft puffy skin, no fluid. Ulcers and infections are common in Pendulous Calluses.. These calluses are most often seen in English Mastiff breeds and German Shepherds, though can be present in any large breed Due to constant pressure and weight, the callus grows and grows. The skin of the callus rather than being tough is soft, can be quite large and multi-lobed and is easily torn. DogLeggs recommended treatment: DogLeggs cannot reduce the size of a Pendulous Callus, the body have grown all this extra skin to protect the bony prominence of the elbow from constant trauma. 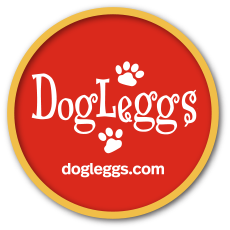 DogLeggs provide comfortable coverage, protecting the elbow and callus from further trauma. Ulcers and infections are reduced if not eliminated.